Jim Courtright was the kind of man willing to oblige anybody with big trouble provided he was a reputable gunslinger. He knew exactly how to measure a man by the general appearance and particularly the manner in which he wore his gun. Long-haired Jim was like greased lightning with a single or twin Colts and he had learned to shoot accurately out back of the barn in Iowa where he spent his boyhood. It wasn't until he entered the Civil War that he got to see the country and also learned the fine points of blood-letting. As an army scout, under General Logan of Texas, Arizona, and New Mexico, he had plenty of time to grow long hair and provoke barroom fights and thus satisfy that strange hunger of the killer. Jim was one of the few gunfighters who was both dark-headed and dark eyed, as the majority had washed out blue eyes, and the pallid complexion of night life. Jim had a gunfight in Fort Worth with half the town getting the opportunity to see him unlimber and kill, so it is little wonder he was offered an appointment as marshal, which he accepted. He went to work by cutting down a few smart alecks to let the town know that Jim Courtright meant business. He played up to the politi cal element and eventually ran a shakedown business in which he found himself out of a job and without friends. Jim had reached a plateau in gunfighting fame where the expression ran: "Look out. Here comes Jim Courtright." His walk took on a swagger and his manner was casual - like a cat. Jim couldn't get a job. He was forced to take one from General Logan as a foreman of his ranch in the American Valley in New Mexico. 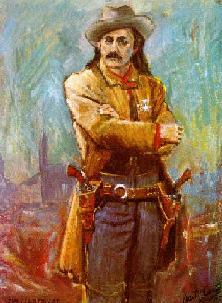 There was no ques tion as to Courtright being a fine horseman let alone a good gunman. It was his job to flush out the rustlers on the ranch and kill them without quarter. But when Jim got to shooting he never knew exactly when to let up; he not only did in the Mexican rustlers but honest home steaders fell under his vicious gun. He gave no quarter whatever. This riled the towns-people and so much pressure was brought to bear on the General that he had to let Jim go and advised him to leave in a hurry. He no more than reached Fort Worth again than he was arrested by the U.S. Marshal. Jim escaped and man aged to go on to South America, but he returned in a few months and stood trial and was acquitted. He had to take on a job as a bouncer in saloons and gambling casinos, killing several men on the self defense alibi. He finally decided to open a detective agency, which he called the Commercial Detective Agency. This was, in reality, a front for the clandestine business of shaking down gambling men who had to pay rather than risk being either frisked or shot down. Finally, Luke Short showed up in Fort Worth, a gun fighter of considerable reputation, and established him self in what he named the White Elephant Saloon. Jim was on his heels to give his so-called protection that Luke might run his business in peace. But the Dodge gunfighter told him to go to hell, that he could do all the gunslinging necessary to keep himself clear of leeches. On February, 1887, the famous street fight between Courtright and Luke Short took place. Luke got in the first shot which tore off Courtright's hammer thumb, while Jim made a border shift without effect, being too late, and Luke blasted him three times as he staggered and sank to his knees in the street, then fell over on his face. He died in his thirty-ninth year, but it took a great gunfighter to bring him down.